In 2010, China overtook the United States to become the country with the largest installed wind power capacity, the official Xinhua News Agency reported on Thursday. 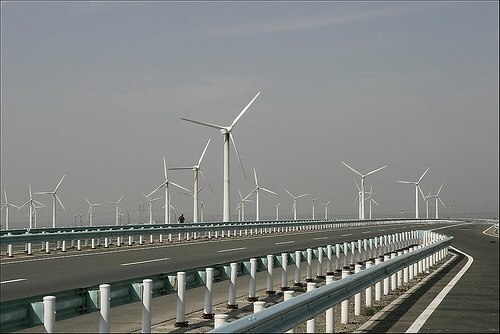 China’s total installed wind power capacity reached 41.8 gigawatts at the end of 2010. Installed wind capacity in the Untied States increased by about 5 gigawatts to 40.2 gigawatts. China increased its wind power capacity by 16 gigawatts or a staggering 62 percent from 2009, according to data released by the Chinese Renewable Energy Industries Association. Chinese government initiatives have nearly doubled China’s wind power capacity every year since 2005. The Chinese government set a target of 10 percent of the country’s energy mix by last year, However, this target was not met because hydro, solar and wind power together reached 9 only percent. Do we have a ‘space race’ style clean technology (cleantech) race on our hands? If so, what’s the end goal? 100% clean energy as fast as possible in both countries? Bring it on.